Thursday for work we went to Panera Bread for lunch and boy was I happy to see their Strawberry Poppy Seed Salad was back. It’s my favorite salad. I love it so much I decided I would replicate the recipe and share it for you. This salad is very light and sweet. It’s perfect for a warm summer day. It’s made with the freshest produce, that I got from the Farmers Market and the dressing is made with a sweet freshly squeezed orange. I really love the dressing. It has 2 teaspoons of poppy seeds in it, but they kind of sank to the bottom, but don’t worry their in there. To make the dressing I went to Panera’s Website and read the ingredients for there dressing and I made my own. It’s so easy and so wonderful. 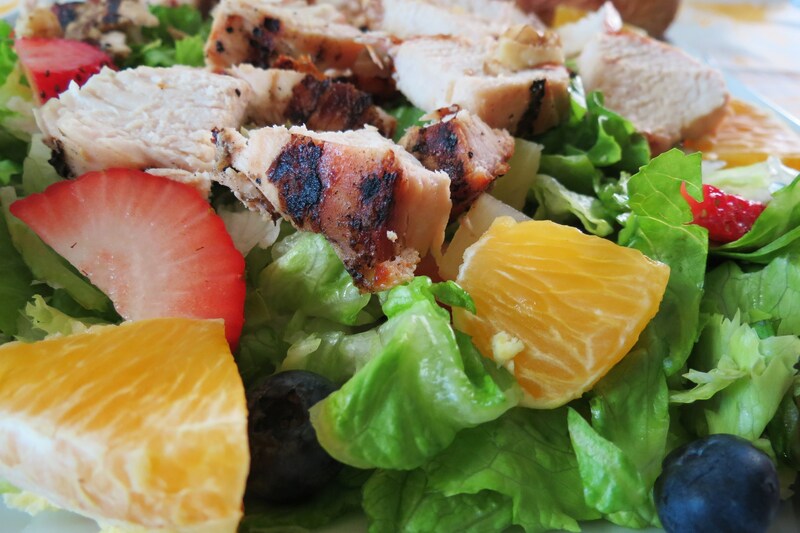 If you like oranges you’ll love this dressing. I also marinated the chicken in the dressing which made it tender and juicy. Perfect for this wonderful salad. I marinated my chicken for an hour, but you could marinate longer for a nice citrus orange flavor. 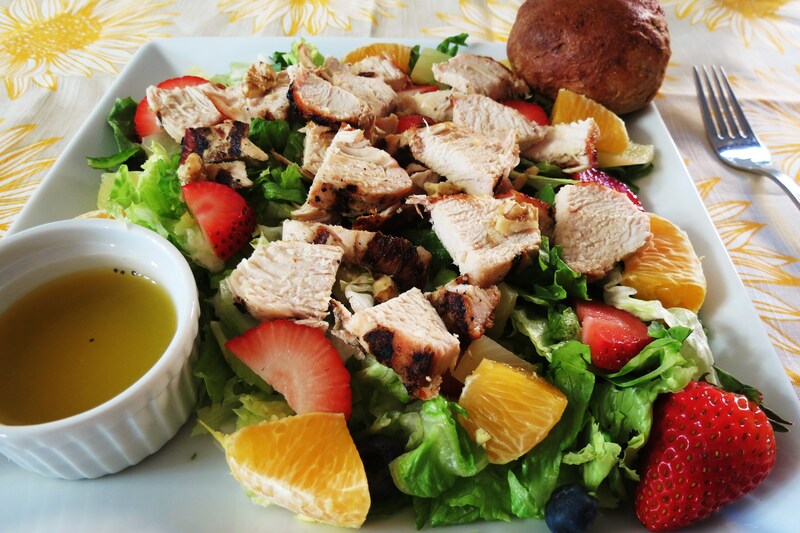 The salad is made with fresh oranges, strawberries, pineapple, blueberries and just a little bit of chopped walnuts. Panera uses Pecans, but walnuts are a little healthier for you and I like walnuts better. The salad makes two big servings but you can easily divide into four side dishes or even better, double the batch and use it for a potluck. I also think it would be wonderful to serve Mom on Mother’s day too. I am sure she would appreciate a nice healthy salad full of fresh fruit and tender chicken. I asked Hubby if he wanted my salad for dinner and guess what he said? Ok, sounds good! Can you believe it? Two salads in a row. I even served it with my homemade Wheat Rolls and he said he’ll take two. What? You have to know him, he hates wheat bread, but he ate them. He did tell me he liked my Chinese Chicken Salad better that this one was a little light for him. Now you have to remember he is a meat and potatoes guy, not a fruit guy! I’m just happy he ate salad. It beats the truck load of hot dogs and hamburgers he made himself this week. Blah! Now don’t get me wrong, I don’t mind a hot dog every now and again, but he eats like 5 foot-longs in one sitting. I don’t know how he does it or how it fits in his stomach. I’m lucky if I could finish one foot-long! 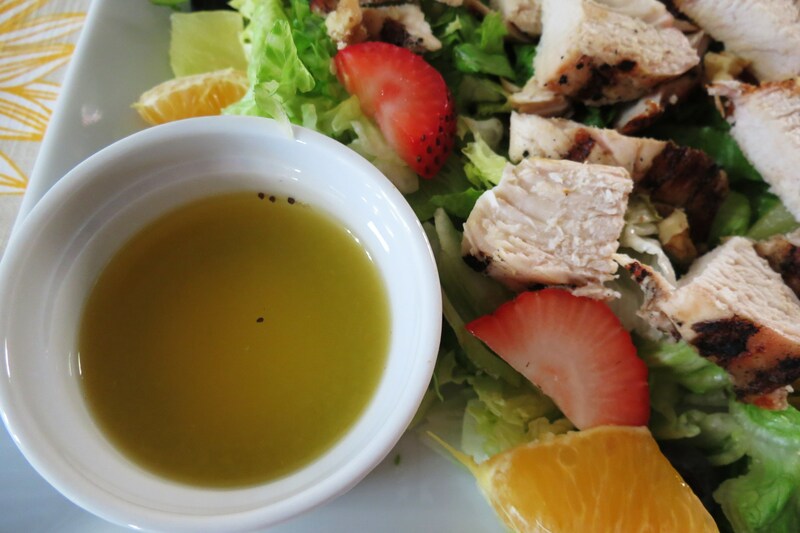 A sweet light salad made fresh fruit, topped grilled chicken and drizzled with a citrus poppy seed dressing. 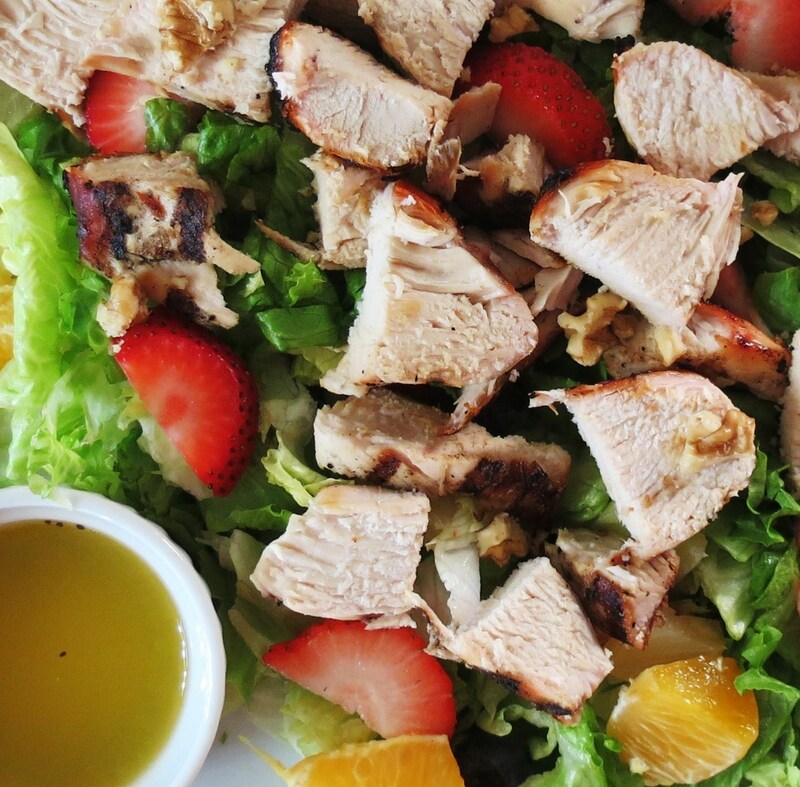 For Salad: Marinate chicken in ¼ cup poppy seed dressing for 1 - 4 hours. Heat grill to medium. Cook chicken for about 7 minutes per side until no longer pink. Meanwhile on two plates, evenly dived the lettuce, strawberries, blueberries, orange, pineapple and walnuts. Add 4 oz chicken to each plate. Top with 2 Tbsp. of poppy seed dressing to each salad. Do you like Panera Bread? What is your favorite meal to have their? I am love the Strawberry Poppy Seed Salad but I also love their Asian Salad. Not to mention, when I feel like splurging there cookies are amazing. I was a good girl and didn’t order any. Actually I have been good for a week in a half. I haven’t had any bad sweets, or any processed foods. Once I passed the coffee withdrawals, I’ve been pretty good and I have energy. Can you believe I haven’t had a real cup of coffee in a week? Except for my Coconut Mocha Frappe. I have had a cup in the morning, but it’s only been decaf. I can’t believe I did it! I went from 6 or more cups a day to 1 and it doesn’t even have caffeine! If you knew me, you would be shocked by that. Now I have natural energy. But I will tell you I haven’t skipped my Starbucks, I just have been ordering unsweetened iced green tea. It’s pretty good, it has a slight mint flavor to it. Very light and refreshing! Gives me just the right kick of energy. Well my wonderful friends, I have a busy day ahead of me. I have to make cookies for the charity I did, go to the post office and bank. Plus make some goodies so I have some stuff to post for you next week. I’m going to try my darndest to get a post to you every day next week while I am traveling. Have a wonderful day and hey, it’s Friday be happy!! Any plans for Mother’s Day? What a delectable salad! Looks so colorful, healthy and delicious! I love Panera Bread salads! I’m very happy they’ve brought this one back but even happier that you’ve posted this recipe. I love it and also love the Thai Chicken Salad and the Chicken Asian Salad. It’s so nice to be able to eat out and yet now blow the calorie or carb count for the day. I’m with you Beth! This is my favorite salad and the Asian Salad is my 2nd next favorite. Give my recipe a try! I took there ingredients from there website and made this salad. it tastes pretty close to the same. I can’t believe you got the husband to eat salad TWICE! You’re a rockstar. Obviously. For my future mother’s days I definitely would rather stay in and eat a homemade breakfast than be dragged out! At least I know I’ll be getting something healthy delicious and worth the calories. I am sure I’ll be dragged out, but hopefully it will be my favorite breakfast place. It’s a little bit of a drive, but well worth it! No need to ship it, you just have to make it! It’s fast and easy, just the way I like to cook! I have heard such marvelous things about this salad. Thanks for recreating it for us to all have it at home…it looks amazing! Thanks Liz! If you do go to Panera you have to try it!! It’s my favorite! Love this sweet-savory salad! 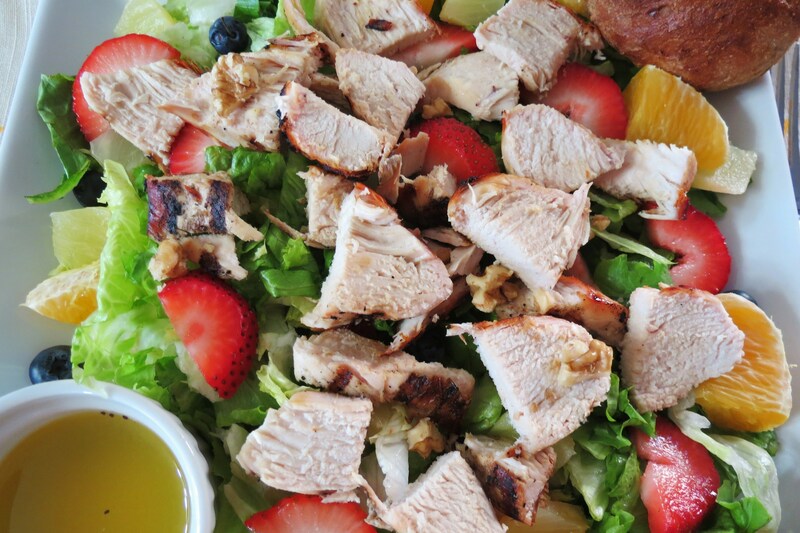 What a great idea to combine grilled chicken with juicy summer fruits! Thanks for the inspiration. 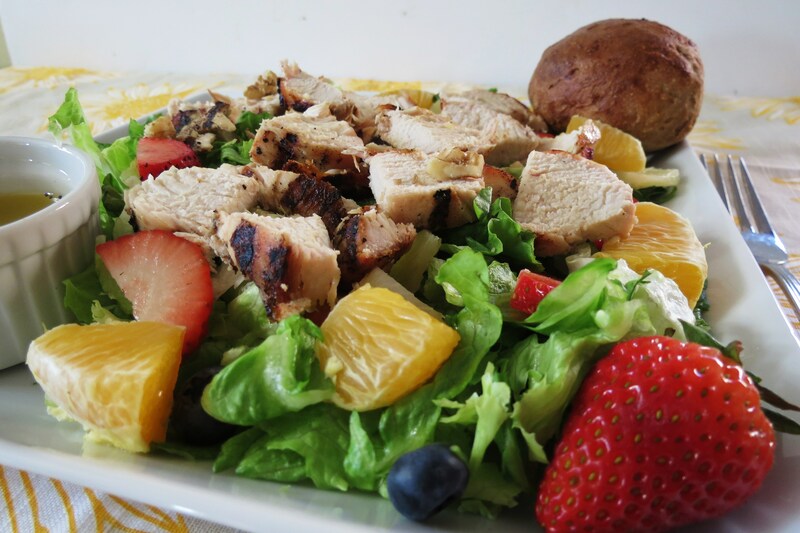 Up until a few years ago I would never of thought of chicken and fruit together, but it is a great combination! 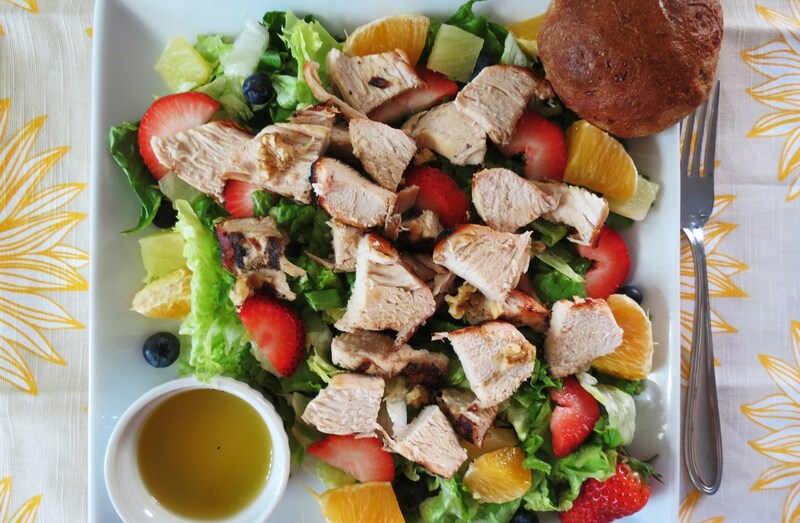 This salad looks amazing. So colorful, and sounds delicious! Have a great Mother’s Day weekend! Happy Mother’s day to you!! Can’t wait to try your chocolate waffles! If I didn’t already have my mother’s day menu planned and ingredients bought for my mom, I’d definitely be making this for her. It’s right up her alley and surprisingly enough I have all the ingredients on hand. Make it for yourself Samantha! You’ll love it!! have a great weekend!! FANTASTIC! My guy would gobble this one right up! He loves meat and potatoes – but he adores salads! Thanks for sharing! Thanks Ann! Have a wonderful weekend! Going to miss your blog! Next week for a baby shower I’m making your blueberry cake you posted last week! I know it will be a hit! Thank you!! it’s one of my new favorites! Can’t wait till next mix it up Monday! Thanks for having me!